The first section of the ceiling paintings of St Paul’s Church in Birkirkara was inaugurated on Tuesday evening by church rector Nicholas Doublet. These paintings are currently being restored to their former glory by Atelier Del Restauro as part of a restoration project supported by Bank of Valletta. The small church, situated in Valley Road, is dedicated to the conversion of St Paul and the paintings are the work of late artist Giuseppe Briffa, who carried out these artistic works between 1945 and 1968. The paintings illustrate the life of St Paul with special reference to his life in Malta. Prof. Briffa had used a marouflage technique with the artistic work painted on canvas at his studios, stitched together by his wife and then glued to the ceiling. Restorers Maria Grazia Zenzani and Valentina Lupo said that the project included consolidation of the marouflage support, extraction of salts, adhesion of detaching paint together with cleaning of acidic deposits of pollutants and oxidised varnish on both the paintings and gilded decorations. The cleaning revealed the original luminous palette of artist Giuseppe Briffa. 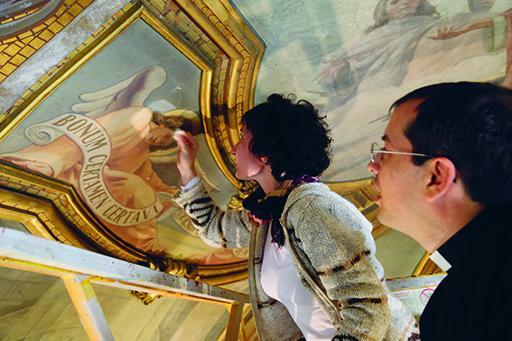 Restoration works on the paintings started three years ago and are expected to be concluded by end of next year. Over the years, these paintings underwent considerable damage through neglect, pollution and water seepage. The timely intervention of Fr Nicholas, Atelier Del Restauro and Bank of Valletta saved these national treasures before they were lost forever. “The Church of St Paul is a small church and from the outside you would never think that it has such a rich cultural heritage," Charles Azzopardi, BOV's executive for PR & marketing said.